Through the magic of modding, Scourge of War is now the best way to recreate Napoleon-era battles in multi-player. 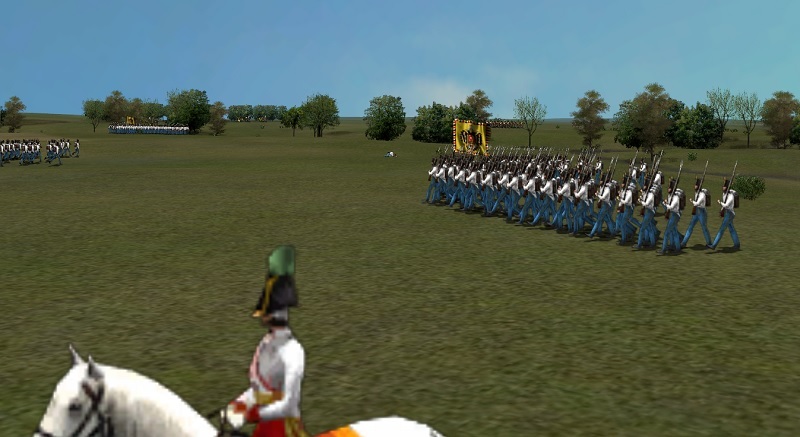 To introduce more players to Gunship24’s wonderful Napoleonic mod, “Road to Wagram/Peninsular” a special Napoleonic Italian Campaign MP game will be hosted on Saturday May 4. There’s no need to run the GCM Launcher or join the Battle Queue for this one! 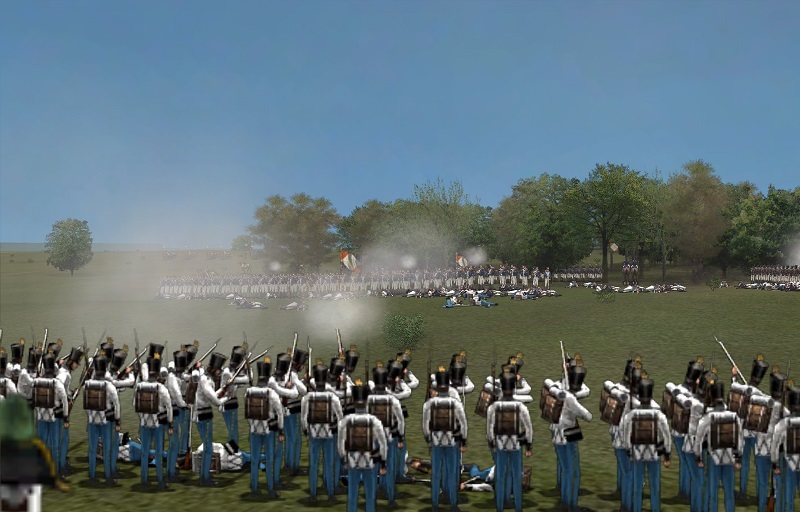 Those new to this mod and format, should consult the Step-by-Step Guide included in the previous Waterloo Event for a list of mods, maps & files that must be downloaded & activated for the game. Kevin (MTG) and Stefan (Leffe7) will be CinC's for this one. Later today a handful of players will be committed to each side and other basic scenario info made available to our fearless leaders to make preliminary planning possible. This would be using the GCM teamspeak server, I take it? Khryses wrote: This would be using the GCM teamspeak server, I take it? We'll use the GCM TS server as it provides more options for switching out sides for the pre-game councils and in-game movement in and out of whisper channels. No problems, I'll hunt down the address prior to the day and get things set up. Khryses wrote: No problems, I'll hunt down the address prior to the day and get things set up. The link to the GCM TS setup is above (3 lines beneath the top image). Just signed-up for this Ron. Sorry for late notification but we've been away. I see the start time is listed as 19:00GMT/ 20:00 BST etc. Just double-checking that means 20.00 for those of us in the UK, as we are now on BST. Right? Martin wrote: Just signed-up for this Ron. Sorry for late notification but we've been away. Martin, glad to have you in for this one! You're correct about the time: It is 20:00 British Summer Time (what I understand you're using these days). See you Saturday. Many thanks Ron. Looking forward to it. My brother, Nappy, ordered our corps to hold east/west road at Eixo. We had intelligence that placed the perfidious Austrians somewhere east of us. When we arrived, it was apparent that this made a poor defensive position. The area was bounded on the north and south by low hills. Only the ground along the Rio Duro held any promise for defense. I felt it unlikely that the Austrians would be so obliging as to march down that road and confront us. More likely, they would approach the town either from the north or south. Using the map below, a council of war was held where our options for the upcoming battle were discussed. It was decided that Grouchy would take the cavalry SE to the Estrada Seixo NW of the town of Periera. Grenier's division would be sent north to the heavily wooded area surrounding the Rio Duro. By these deployments, it was felt that the main body would have enough advanced warning as to where the Austrian column would be heading. Once this was determined, the main force would march to the high ground and meet the enemy as far forward as possible. This would allow us to defend in depth, and hopefully confuse that sycophant Arch Duke of our strength and intentions. All proceeded well. Both Greneier reported and Grouchy reported a column of cavalry and infantry marching west from Frechas. Grouchy also reported activity just north of Periera. Still unable to determine which column was the main force, Barbou's division moved south to the heights there. Soon it was observed that the Frechas column had turned SW, seeming to head for the road to Eixo. The corps artillery along with a brigade were brought to very nice ground just east of the river. 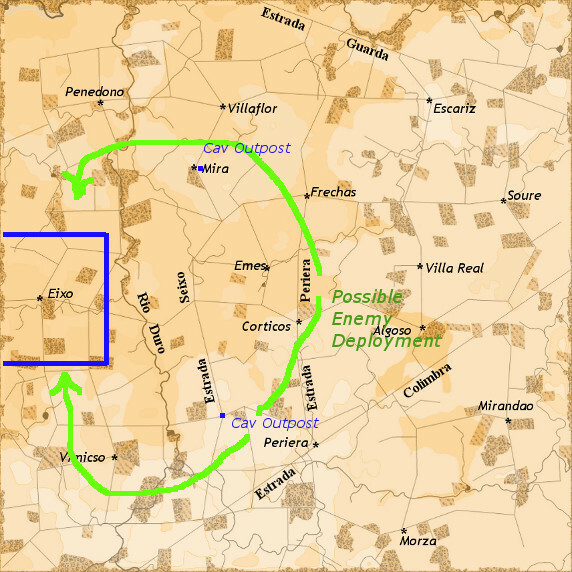 Grenier's division was recalled and moved south towards the Eixo road. No enemy was approaching from the north. A lucky sighting by one of my staff, of an Austrian wagon far off to the south, told us that the main thrust would come from that direction. General Durutte's division was sent south to join with Barbou's. 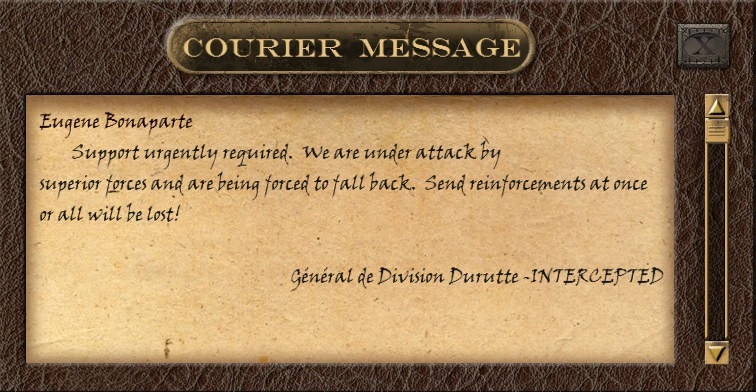 Unfortunately, Durutte was quite drunk, fell off his horse and had to be taken unconscious to the field hospital, where he remained for the rest of the day. The Austrian diversionary column soon appeared SE of Emes. Our guns opened upon them and kept an enemy brigade in check. 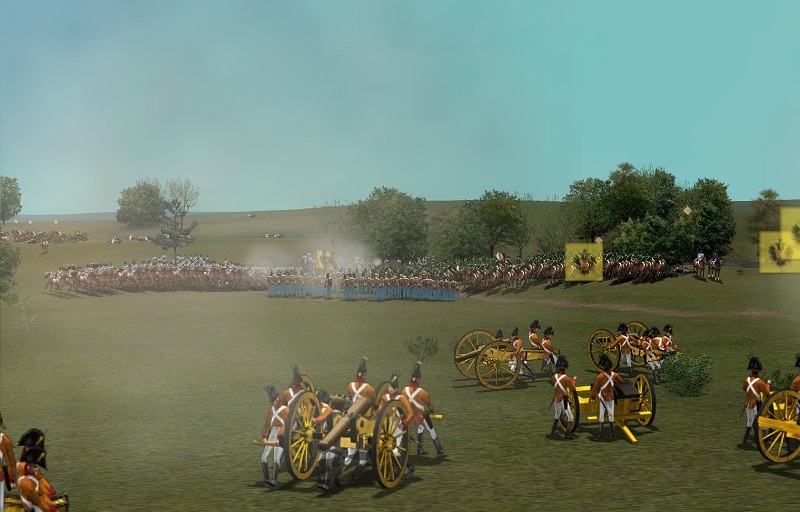 The Austrian guns soon arrived and a lively artillery exchange ensued. 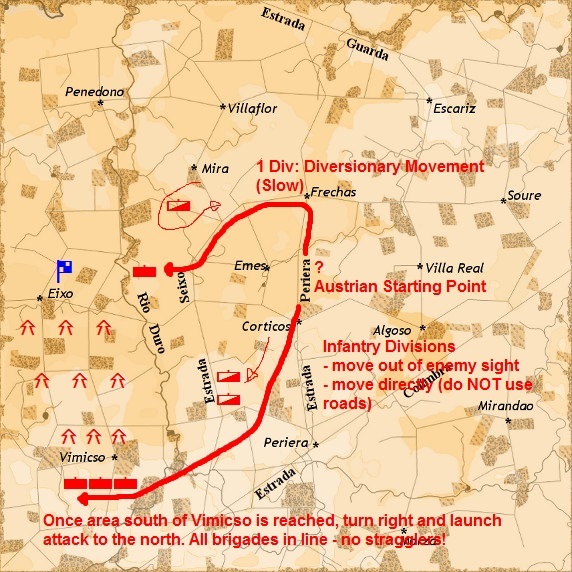 Grouchy had advanced his cavalry north along the Estrada Seixo and engaged another Austrian brigade of infantry. Just as Durutte's division filed into position, two enemy divisions advanced. And just as the battle was joined, Barbou who apparently was also drinking while in the saddle, lost control of his mount and was carried off the field, all the while shouting, Vive la France!" He has yet to return. With two senior division commanders down, those units were poorly led. At this time the enemy diversionary column moved towards the battle and hit our left flank. It quickly crumbled. The Austrian cavalry roamed the field attacking with impunity. It was only by the determined efforts of the French squares that they were finally driven off. But those squares paid a heavy price as enemy infantry poured fire into their ranks. Two brigades of Grenier's division formed in the woods at the base of the heights along with the artillery. There they held the onrushing Austrians long enough for our broken troops along with one fresh brigade to reform near our original objective. Meanwhile, our cavalry finally broke the stubborn Austrian brigade and then proceeded to capture most of the enemy artillery. Although significantly outnumbered, we were able to hold onto the road. Two waves of Austrians attacked and were repulsed. They too were tired and used up. As darkness fell, the enemy withdrew. The butcher's bill was quite high for both sides this day. I'd like to thank Ron for another great scenario. It made for some very interesting tactical problems and a great deal of heavy fighting. I rather like the explanations for Digby and me having to leave the battlefield. Rum rations for everyone! To clarify - and partly explain the long silence we hope you had - our actual deployment was east of the Villa Real. I'll let Leffe explain the full brilliance of his plan, but as the flank brigade with the longest to march (cross-country a ways south of the Estrada Colimbra and then up on the left of the Austrian advance) it was a full hour and a quarter of game time before we came into action from behind the French right flank. Two and a half hours of real time with only a brief glimpse of the French prior to action! If we'd only had another half hour we'd have had you off that objective - you drove Palmer off just as my brigade came up through the trees, and (believing your men were largely spent) I took a hand at driving you off. Unfortunately for my men you still had some fresh Guard in reserve, and we soon found ourselves bayonet-charged back into the woods to wait out the last five minutes of the game re-organizing as the bulk of the Austrian army came up . The battle went very well and I am very pleased by the action of our men. My Plan consisted of a diversionary movement in the north (Palmer), while the main attack would come from the south (Hays, Forrest, Khryses) against the French positions near Eixo. The splitting of my command meant a considerable risk, as the lines of communication were very long. 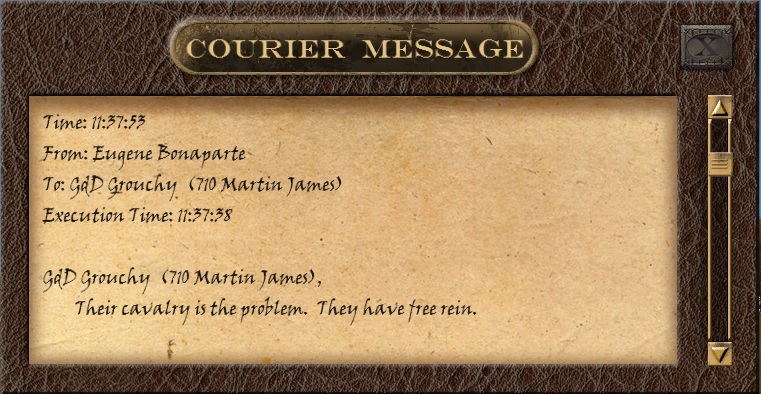 Additionally I ordered to maintain a courier-silence until enemy contact was made to prevent courier interceptions by the enemy. I stayed with Palmers division and the artillery in the center while our cavalry (Mitra) was nearby and spotted enemy cavalry to our south. The first French colors were seen NE of Rio Duro, and reports came in about infantry moving north. Palmers advance in direction of Eixo was halted when several French batteries lined up on a ridge just east of the Rio Duro. This was good news, because when the French artillery was here, they couldn't stop our southern attack. There was a lull in the battle, when both sides artillery were taking their shots without huge effect. No word or sighting of our southern force for a long time. Mitra informed me that lot of enemy troops were deploying near Vimicso to counter our southern divisions, but I couldn't see much from my position. What if the enemy was concentrating on the south too with all of its forces and the artillery in the center was just a diversion for us? There was not much infantry to be seen, just one or two regiments around the artillery. But also some of the French Senior officers. It was time to put everything on one card and to shorten our lines. 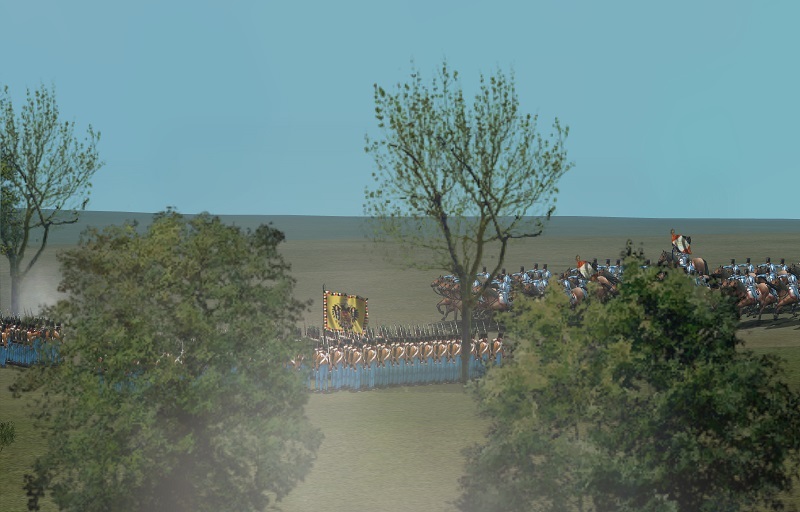 I ordered Palmer and Mitra's cavalry to move southwest to attack the French infantry which should (hopefully) also be attacked from the south soon. I followed behind with the artillery. Heavy action took place north of Vimicso, but the French lines crumbled soon under combined attacks from multiple directions. Palmer had to leave one Brigade east of the Rio Duro in squares as they were threatened by the French cavalry under Grouchy. The battle in the center was intense and the French lines had several holes in them. Palmer went directly NW to the objective with just one brigade and even held it for a short time, while Hays and Forrests Divisions advanced N like an impregnable force. From my position NE of Vimicso I had to witness the charges of the French cavalry. They moved cautiously before, but repeatedly pushed the remnants of one of Palmers brigades and finally all-out charged my two artillery batteries there. I was not amused but it was a price I was willing to pay as the main action was going very much in our favour. The enemy concentrated all its remaining infantry and artillery in a desperate attempt to maintain control of the objective, but it was obvious that it was only a question of time until they would be driven away by our forces. I also enjoyed reading the courier messages during the battle. Not all of them were easy to understand: "Enemy spotted W of Estrada" - which Estrada? And I also loved this message by AI-controlled Durutte to the French CinC. I had been feverishly looking forwards to this game all week! We don't play enough of these and I was so annoyed when my internet connection had a burp about 20 minutes in. Damn frustrating. Mind you these Italians do make fine wine. I was able to enjoy a couple of bottles while the battle played on around my 'hospital tent'. I am pleased to hear that my division fought well. Next time I shall do my best to fight with them rather than just wave a glass from the rear. Those intercepted messages explain a lot. As Grouchy, the French cavalry commander, I was blissfully ignorant of events W of the Duro, and thought we were winning. [Well if you're gonna be ignorant, you might as well be blissful]. After defeating Wolfskehl, our cavalry moved W of the river towards the end of the game. We overran the Austrian 4th Artillery Division and captured 12 guns. Moving further NW brought us into the rear of Gyulai’s Division. 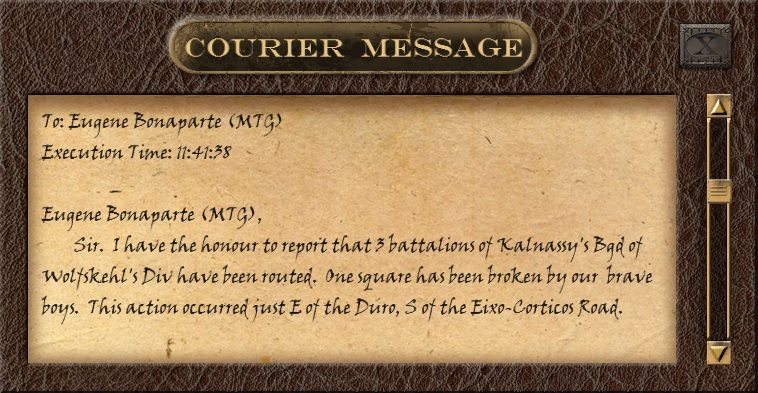 We broke one of his squares and then the game timed-out. I was feeling pretty chipper at this point. Indeed I would go so far as to say that things were looking tickety-boo, Jeeves. Fantastic game, well-played Austria, and thanks to Ron for organising it. Indeed I would go so far as to say that things were looking tickety-boo, Jeeves. Interesting... I predict my brother will have problems with you in the future. Archduke Johann’s Austrians met the French under Prince Eugéne Bonaparte in a desperate struggle for the vital cross-roads at Eixo on the Italian frontier. This contest featured the classic elements of Napoleonic conflict: preliminary, wide-ranging maneuver; feint; deception; cavalry charges; infantry squares.Over 50,000 men were involved. 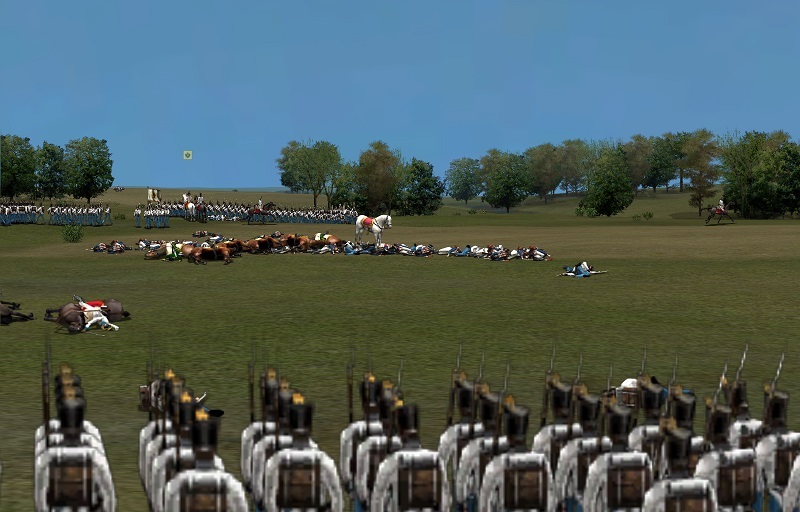 Seeking to deliver a decisive blow from the south, the Austrians executed a brilliantly conceived plan and managed for a time to take the objective with a single brigade. They could not, however, hold. The French, harried by command-control difficulties and with a number of senior leaders rendered hors de combat from weakness for the Italian grape, nevertheless held on to win a narrow victory. Follow the link below to see a summary of the battle results and player Order of Battle. What?! You mean we won after all? Time to return to my memoirs. We shall not dwell on my failure to spot two whole enemy divisions moving around our flank. My readers are not interested in the pedestrian details of reconnaissance (and neither am I, it appears). And they were rather small divisions. I can recommend the bodega at Periera, for tourists east of the Duro. Onto Chapter 2. The military advantages of extra lace on a hussar's pelisse. I can see you'll go far Grouchy. I can see you now, maybe in 10 years time in some quiet part of Belgium, basking in your army command and not noticing a couple of corps of Prussians sneaking past you. Two corps eh? Well I suppose that represents progress. The Austrians have no need to fight. They only need send a few bottles of Chianti and pretty women to pour it. My officers will happily forgo the battle.